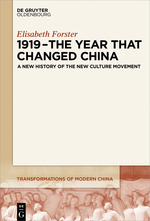 The year 1919 changed Chinese culture radically, but in a way that completely took contemporaries by surprise. At the beginning of the year, even well-informed intellectuals did not anticipate that, for instance, baihua (a precursor of the modern Chinese language), communism, Hu Shi and Chen Duxiu would become important and famous – all of which was very obvious to them at the end of the year. Elisabeth Forster traces the precise mechanisms behind this transformation on the basis of a rich variety of sources, including newspapers, personal letters, student essays, advertisements, textbooks and diaries. She proposes a new model for cultural change, which puts intellectual marketing at its core. This book retells the story of the New Culture Movement in light of the diversified and decentered picture of Republican China developed in recent scholarship. It is a lively and ironic narrative about cultural change through academic infighting, rumors and conspiracy theories, newspaper stories and intellectuals (hell-)bent on selling agendas through powerful buzzwords. Weitere Informationen zu diesem Titel finden Sie hier.